Money is the only place where the Phillies can compete. Not because they stink but if Machado wants to be a Yankee. And I'm sure Harper would love to be close to home, and on a team that has been to the WS two years running when he's never even been in a playoff game. Everyone is kind of in the same boat now, the Phillies included. How long before Pollock or Moustakas are off the market. Is Keuchel going to be this year's Arrieta? I'll be curious to see how hard the teams are working this weekend, obviously LA and Cincinnati wanted to get their deal done. Klentak must be getting very nervous. If McCutchen is the centerpiece of the off season it was a complete and total failure. Machado still seems to desire the Yankees and will sign there if the offers are close. 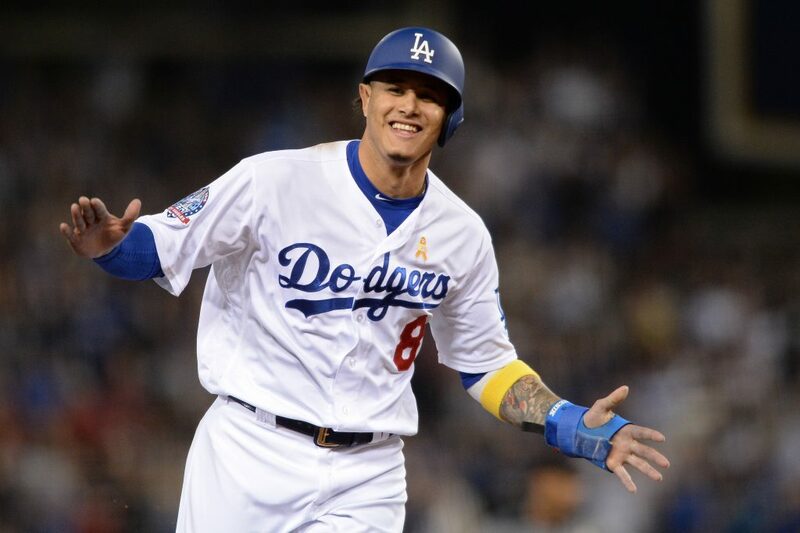 The Phillies will have to make it not be close and buy Machado out of his Yankee dream like the Nationals did with Corbin. Otherwise, it may well be that the Phillies picked the wrong winter to try to push the envelope. Why not "overpay" if it improves this team. Are you paying an excise tax to Middleton or something? Your embrace of mediocrity is repetitive. Apparently overpay is a dirty word. I think this is a reprise of the history of Phillies management, and for the most part ownership -- although I retain hope that Middleton is different. We have traditionally been the team most eager to wage the commissioner's wars against rising salaries. We have been willing to act like a small market team, despite being penalized in the draft and international allocation as a big market team. If we don't spend, we sacrifice our only apparent advantage. If we don't get Machado, this will have been a bad off-season: missed the LHSP FAs, missed Miller, missed Brantley. Just don't want him doing something stupid. Those leaks throughout the early offseason and winter meetings were so pointed and obviously from the inner front office that if he gets nothing, he may not last until next season and rightfully so. The Reds look smarter than the Phillies at the moment. When a GM is being shown up by the Cincinnati Reds front office, that GM needs to take a long hard look in the mirror. Wait, we're saying we should have made that trade? I mean, Puig is a big talent but he's only got one year left on his deal and is not w/o issues. Wood would have been okay of course. I'm not giving up prospects and taking back Kemp though. Way too early to pronounce anything. Or even blame the front office for media reports saying they wanted Miller badly. Obviously not! So far they have not "missed" on anyone, they chose McCutchen over Brantley and they did not go to the wall for the LHPs but that was also a choice. I'm still okay with that, for now. I'm also okay with missing out on a 34 year-old reliever (Wagner and Pap were both 31 when we got them). And they've still replaced 25% of the line-up already. The real issue, to me, is not that we're desperate for Machado or Harper per se, but that the rest of what we already had is so underwhelming. Nobody actually wants to rely on Franco or Nick Williams. Herrera and Hernandez are still unpredictable. If two of those four players were actual everyday consistent all-stars the need would not be so acute. But there's no way they don't know this. Especially since there's no one like what the Braves and Mets have on the way. Harper's never won a playoff series, but he has played in a few. Some think the Dodgers will just go sign Pollock, btw. The Nats lost in the NLDS all 4 times. Well, in any case, all the Phillies can offer is money. The Dodgers have both location and a more likely postseason. The Nats have familiarity and unfinished business. This is such a valid point, but it is magnified because they have basically admitted as much in their vocal, aggressive pursuit of Machado and Harper. They have been talking about this offseason for years. Probably didn't have anything to do with the drafts, but maybe it did? I don't think it has anything to do with the drafts, even the best expectations of Randolph and Moniak wouldn't have had them ready to start every day this year. I imagine if they could do it over again they would have done last year differently - it was a wasted year in terms of seeing what they had with Franco, Crawford, Altherr (and to a lesser extent Williams) and the Santana/Hoskins move was a mistake. I thought it was fine they shied away from Cain and Martinez then but now that they have signed McCutchen it wouldn't have been as big a deal (plus they may yet have to get another OF instead of Machado). I think this FA class just happened to line up perfectly with the rebuild timetable. But they're still not the Cubs or Astros, the model has fractured there. Really, the only two big moves Klentak has made besides Santana and Arrieta are locking up Kingery and Herrera, and the whole point of those deals is to provide cost control that you can exploit for free agents. When you screw up the draft as bad as the Phils have done over the past eight years, you are pretty much forced into the UFA market if you want to contend. Like it or not, that is where we are. It would be a huge help if Kingery turned into the dynamic player he looked like during 2017 at AA and AAA. That would allow us to upgrade from Hernandez's not horrible but pretty mediocre level of play. It would also be a huge help if either Williams or Quinn developed into solid, above average major league players. To me there is no hope for Herrera who will continue to decline now the ML pitchers know they can get him out without ever throwing him a strike. I personally think that Franco is adequate at third in the absence of Machado. And Alfaro will continue to improve. We need Kingery and one outfielder to really step it up and we would be a respectable team. But the problem with the draft was in selecting Randolph and Moniak. I agree that they shouldn't have been expected to contribute full-time in 2009, but... if instead of Moniak, we select Sencik -- we have our full-time starting 3B for 2019. Though Moniak and Gowdy are sorta of a package deal, if the light goes on for Moniak this year (he's all of 20) and Gowdy rebounds from his ACL, suddenly the draft doesn't look so bad. Unfortunately, I don't think there's any hope for Randolph. I actually think that Randolph has a bit of hope, though not much. His BB% (48 BB/410 ABs), K/BB ratio (basically 2:1) all indicate they were right about the hit tool...the power is what is embarrassing (.322 SLG in Reading). He’s only 21 years old, 22 during the summer. IF (big IF) he could grow into some power he’d be a marginal LF and have some level of value, even if he had to sell out more and increase that K:BB ratio. Am I ready to bet on that? No. Was it a bad Top 10 pick? Absolutely. Do I think in the next 2 years he could get there? It’s possible.